Last week, I was looking after razor clams. They are sweet, meaty and succulent. I absolutely love them! I cooked them when they were dead, when they were alive and when I just wasn’t sure if they were or weren’t.What I learned is that you should keep them alive and you should always cook them when they are alive. I learned many things by asking questions to my followers on Twitter – thank you! Razor Clams usually move or retract when you touch them. Touch them or pull at them gently to see what happens. If they are in the shell, run your fingers down the opening side, you should be able to tickle them – they should be moving. To keep the razor clams alive, make sure they are all alive when you buy them, that they are packed properly in some paper, that they are not sealed in a plastic bag as they can suffocate. As soon as you get home, place them in a container – bowl or such and place a wet cloth over them and keep them in a fridge and not in ice as when the water melts, you may drown them. The mouth is where you see the dark circles, that bit should be able to breathe. This is another really simple recipe that is fast to cook and serve. Always remove the sack of grit that is underneath the body of the clam either at the table once they are cooked or just before you cook them – which would kill them though. Prepare the sauce by mixing dark soy, a squeeze of lemon, Shaohsing, honey and ginger. Balance your flavours to sweet, sour and salty. 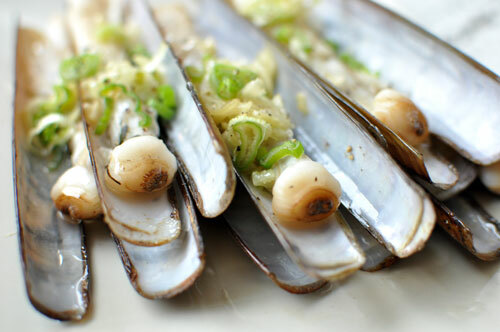 Place the live razor clams into a steamer with a garlic clove and steam for about 5 mins or when the shells have all opened. Place on a serving plate and garnish with spring onions and a little sprinkle of ginger. Brush the clams with a little oil and drizzle over a small amount of the dark soy mixture. A few drops will do because the clam has a lovely flavour already.